Arne Winkelmann, an architecture expert based in Frankfurt am Main, would like to see more a more critical approach to the Bauhaus school: an interview. Mr Winkelmann, you have a doctorate in architecture, you research the Bauhaus, hold workshops and lecture on the art school from the Weimar Republic. Are all the festivities in honour of the centenary necessary to remind Germany of the Bauhaus? I don’t think Germany needs to be reminded. The Bauhaus has always been present, there has been a lot of research done and the libraries have plenty of material. You don’t really have to explain the Bauhaus to anyone today; it has become part of the cannon. And yet, in my workshops with high-school students, I have found that there is still a lot we need to communicate. They might recognize a Wagenfeld lamp and the Bauhaus building, some even a Wassily chair. But all they see is a style they find too stark, boring, “not beautiful”. Then I explain why the Bauhaus is still very much a part of our world today, even though it’s a hundred years old. Architectural historian Arne Winkelmann | Photo: © Arne Winkelmann How do you communicate this to young people? I often use a chair to illustrate the idea. When I set out to design a chair, I have to figure what makes it work as a chair: How high do I make the seat, how large does it need to be, and what is the best angle for the back? These are three parameters the basic function of a chair has to cover. How it looks or what it is made of comes later. This approach is still a very valid, even modern design strategy: we start by clearly defining the scope of a project before jumping in, instead of starting with a formal design concept. You also teach art teachers about the Bauhaus. Is there anything new for them to learn? Definitely. What makes it so interesting is that many elements we take for granted in art education today are based on the Bauhaus. The elementary exploration of shapes and colours, the colour circle created by Johannes Itten, material studies, the frottage technique often used in art classes; all of these were developed in the Bauhaus. Many art teachers are not aware of the connection. As fascinating and influential as the school was, some things also went quite wrong. Take the architecture of the 1960s and 70s, for example. You are referring to public housing from the past century, a kind of “unarchitecture” of large housing estates and high-rise blocks of flats. It’s true that this approach was the logical extension of the concept of public housing devised in the 1920s. The idea was to create a living environment flooded with light, fresh air and sunshine, an urban landscape that met social, functional and hygienic standards. Good intentions on principle. The mistake was to dissolve the relationships and context of the city. In estates like Gropiusstadt in Berlin and Neuen Vahr in Bremen, living space was separated from commercial space. Neighbourhoods that had grown over centuries were practically destroyed overnight. In all fairness though, this cannot be laid at the feet of the Bauhaus architects themselves, and is more down to those who followed in their footsteps. But it did discredit the Bauhaus. Not the Bauhaus, the architecture of the modern era. These urban estates did lasting damage to the image of architecture. For decades, high-rise blocks of flats were pretty much taboo in urban planning because they were so closely associated with social problems. That is slowly changing again. 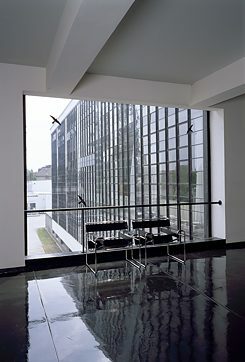 Wassily chairs on display in the stairwell in the Bauhaus Building in Dessau. | Photo: © picture alliance/Bildarchiv Monheim What were the Bauhaus’ greatest accomplishments? Three main things: It introduced a new design aesthetic that adhered to functional aspects. And the Bauhaus shaped a new way of teaching: students attended preparatory courses designed to help them forget everything they had ever seen and learned about art, design and style, a kind of mental reset. This propaedeutic phase and training in traditional crafts were the Bauhaus’ greatest strengths. And the school was also open to women, and all religions and nationalities. So the Bauhaus became a melting pot of extremely creative minds from all over Europe and the whole world. These are key points that will hopefully not be forgotten in all the hype around the centenary. As a Bauhaus fan, I imagine you’d be pleased by all the excitement. If I may, I’d like to ask you a question as a curator, which you are as well if in a different context: If you were able to curate or change the centenary programme, what would you offer? What would you like the general public to see or learn? I would really like to see people understand what the Bauhaus was about, its approaches and solutions, and not just indiscriminately celebrate the Bauhaus style as classical cannon. I would be very interested in exploring why people were drawn to the Bauhaus, for example. Where did young people hear about the Bauhaus, why did they enrol there, and how did they further these ideas once they had completed their studies? So trace a Bauhaus diaspora in a sense? I think that would have been very interesting, yes, a history of the global impact of the Bauhaus. Tel Aviv, the “white city”, will be covered, but people could learn more about the Bauhaus in Japan or China, the USA, Turkey. An overview of the direct heirs like the New Bauhaus in Chicago or the Ulm School of Design would have been fascinating too. 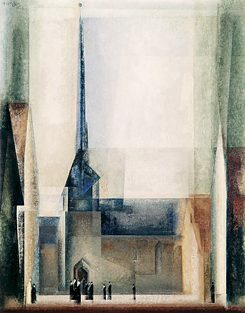 The painting “Gelmeroda IX” by Bauhaus Master Lyonel Feininger depicts the village church in Gelmeroda in the Weimar countryside. | Photo: © picture alliance/artcolor What do you predict: will we ever experience a movement the size of the Bauhaus in art or architecture again? Architecture, design and art are very free and undogmatic, as are programs in the subjects taught at universities and technical schools. There is no need for a revolutionary act to free them from the constraints of academia. Honestly, without a similar fundamental political shake up, like the 1919 transition from an empire to a democracy, I cannot imagine a school as revolutionary ever emerging again. 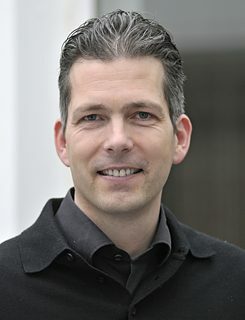 Arne Winkelmann is an architectural historian in Frankfurt am Main. He completed his doctorate in architecture at the Bauhaus University in Weimar and in Krakow, and today works as a curator and publicist for architecture, photography and art. Romy König is a journalist and author who writes on health, business and culture.